An extremely simple, yet impressive dessert, that will make your guests think you are a master Pâtissier! 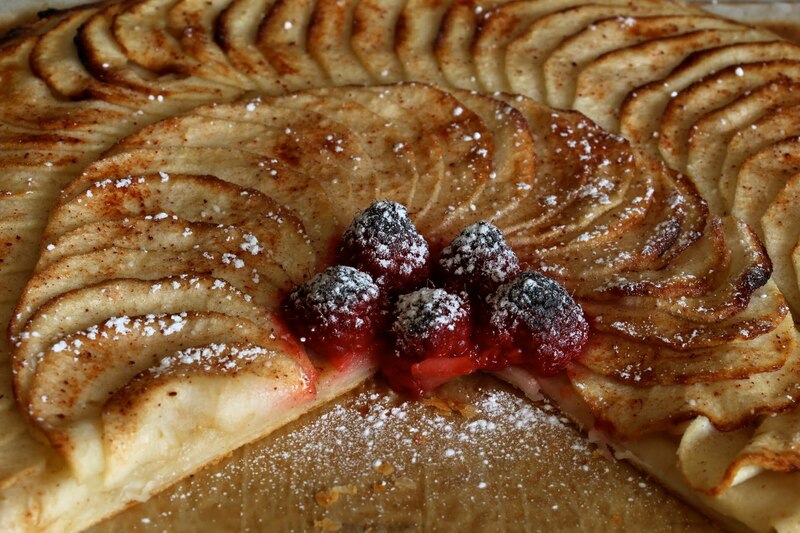 With just a very few ingredients and a little patience you can create one large tart or individual pastries. They may be cooked ahead and simply passed through an oven for a few moments to heat up. Roll out pastry thinly to a diameter of approximately 35-40cm. Place onto a parchment-lined baking sheet and with the point of a sharp knife, trace a line 1cm within the edge of the pastry to form an inner circle, then prick lightly all over the inner base. This will prevent irregular bumps rising when cooking. Peel and core the apples then using a sharp mandolin or Japanese slicer, carefully create wafer thin slices from one apple at a time. Over-lap them from the inner scored line in a concentric fashion leaving the 1cm lip uncovered until the tart(s) are finely patterned with the apple slices. Dot some tiny nuggets of butter over the apple slices (or melt the butter and brush over the apples lightly), then heavily dust with the icing sugar mixed with the fresh cinnamon if desired. Bake the tarts in a 180ºc fan oven or 200ºc static oven until lightly risen and the apples are turning golden around the edges (check the underside of the pastry has lightly browned). Serve immediately or cool down and re-heat quickly when needed. Serve drizzled with caramel sauce, honey or maple syrup and some crème fraîche or vanilla ice cream.